Today, I’m loving light lavender / lilac with black! Adding the pop of the color papaya / coral creates a fun fresh wedding color combo for your spring or summer wedding! Cake from Ron Ben-Israel Wedding Cakes … Hand Painted Wedding Invitations by Michelle Mospens at Mospens Studio, Bridesmaid dress from Melissa Sweet STYLE MS110 in Orchid … BRIDE’S Bouquet from TheKnot.com Ron’s Flowers and Gifts in Ulysses, KS photo taken by Jenna Walker Photographers in Denver, CO. Since the bottom of the bridesmaid dress is lilac, I would use a bouquet that features papaya, and a very small amount of lilac. my wedding is in june. i have an ivory dress with silver beading in it, also moh and bridesmaid dresses are sangria. trying to intertwine colors for tables and groomsmen. any ideas? thanks!! Hello Jodi! I would go with light grey suites. Hello Melane! Hot pink, silver and black are very strong and bold color choices. Certainly if they match your personality go for it! Best wishes! 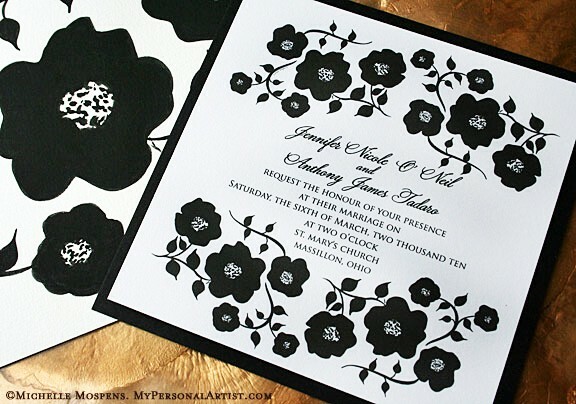 I have looked through sooo many custom invitation websites, and I have to say this Black-White floral motif is one of the best I have seen! The whimiscal shape of the flowers helps to soften the stark black and white color scheme. I am currently planning a navy and white wedding for a friend, and will definitely reccommend this motif. Hello Jessica! Thank you for the kind compliment. We can print in navy ink for you. We can print in letterpress, raised thermography ink or flat ink. Also, we are happy to provide a printable version with the floral artwork only. You all can then print your own wording at home. Let me know! Thank you again. i am in desperate need of some help with summer colors for july 2011. It may still be too early, but would love some ideas. Hi Angela! I added new 2011 wedding colors part two today. Check this color palette out! I absolutely love all your color schemes.. Very beautiful and creative .. i love them all!!! my Wedding will be in October of next year and was wondering if this color scheme would fit fall or if you had another one that would go great ?? My ring is not your traditional ring its a 7.5mm pearl with diamonds around it and i love pearls . Which would go great incorporated with pearls? Hi Melanie! Your pearl ring sounds amazing! Congratulations!! 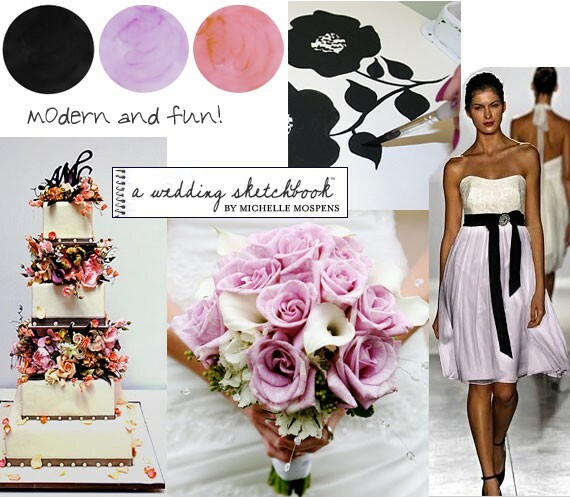 These colors are perfect for your fall 2011 wedding! I am so using this color scheme for my wedding but what flowers would you suggest to add the mango color? I was thinking of Tiger Lily but do you have any other suggestions? Hi Kris, I am a huge fan of peony flowers right now. 😉 Best wishes!